Traditionally the electronic musicians Ron Boots and Kees Aerts (both owners of Groove Records) organized an EM-event once a year, the follow up to the original "KLEM-dag". This event is called E-Live. With the introduction of the magazine E-dition some years ago Ron & Kees decided there should be two events each year, probably also because the Alpha Centauri festival ceased to exist. Although Ron & Kees pulled the plug from the magazine (many people still regret they had to do that) the second festival called E-Day turned out to be equally successful. This time, the festival was not at the University of Eindhoven but in "Theater de Enck" in a village nearby, Oirschot, a place within reach of both Belgian and German fans. The venue proved to be a huge improvement, the atmosphere was superb and sound and light were quite OK. Many attendees could park their cars for free and many were utterly satisfied there was beer available! Upstairs during the afternoon there were several performances by Dutch EM-artists 33 Tetragammon and Human Metronome, relaxing music in the "ambient" genre. 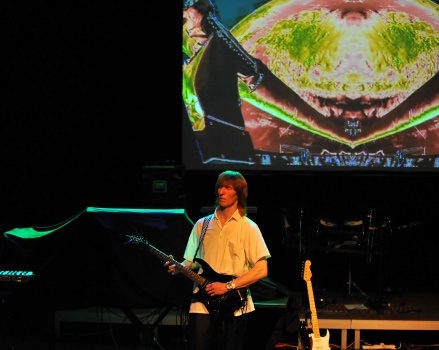 Downstairs in the main hall the festival was kicked off by German EM-artist/guitarist Frank Dorittke aka F.D. Project. As guitarist of the Dinslaken based band Imagine, the guitar had always been his main instrument. Then in the early nineties, he discovered Tangerine Dream, Olfield, Jarre and so on and developed a firm interest in this kind of music. Due to modern day technology Frank is able to play guitar and accompany himself on the keyboards and have rhythm patterns played by a drum-computer. Polarstern was the first tune Frank played. Influences of his heroes are clearly there, but music by Dream Theater could also have been a source of inspiration. Basically Frank plays very nice melodies on the keyboards and lets his guitar do the soloing. Next song was Last Days, followed by Heavensgate. On the big screen behind the artist, there were images, mostly very colorful. Frank subsequently played an updated version of Mandarinentraum and an especially for this concert re-arranged version of The Return of O. Within the EM, the F.D. Project can be compared with Maxxess or some pieces by Teubner. The first encore was the classic Wishbone Ash track Throw Down The Sword. Because of the enthusiastic response from the audience Frank decided to do another encore: it turned out to be a short improvisation round the Pink Floyd classic Shine On You Crazy Diamond. Still the people wanted more, so they got another classic. Portsmouth, a traditional made popular by Mike Oldfield. The performance was very well received and greatly appreciated. Personally I would have loved a little more variation in the sound of his guitar. The second performance was by the well known Dutch EM-artist Gert Emmens. 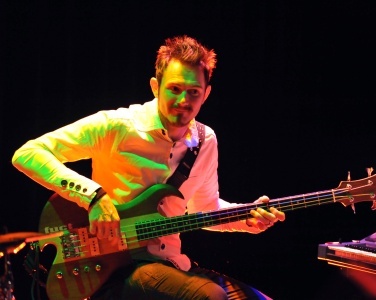 Often he plays with his colleague Ruud Heij but he performs and records as a solo-artist as well. His music can be described as mainly "Berlin School". Relaxing music, floating sequences, great melodies and several nice solos. More than Ron Boots, Emmens creates soundscapes without much percussion elements. 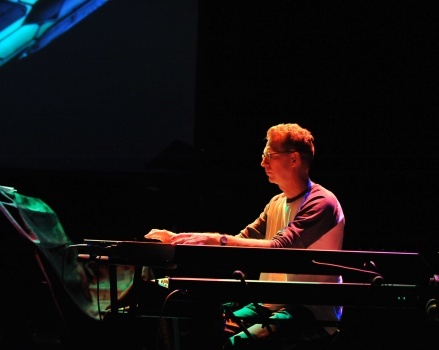 Basically Emmens performed all of his new album The Nearest faraway Place Volume 2 (parts 8 � 14), accompanied by a computer animated science fiction movie on the large screen. As an encore Gert performed a new track, to appear on the forthcoming album Schallplatte 11, the song is called It Was Sad To See You Go. Although totally different from the F.D. Project, many enthusiastic reactions for this artist too! The main act was "Dyson & Friends". 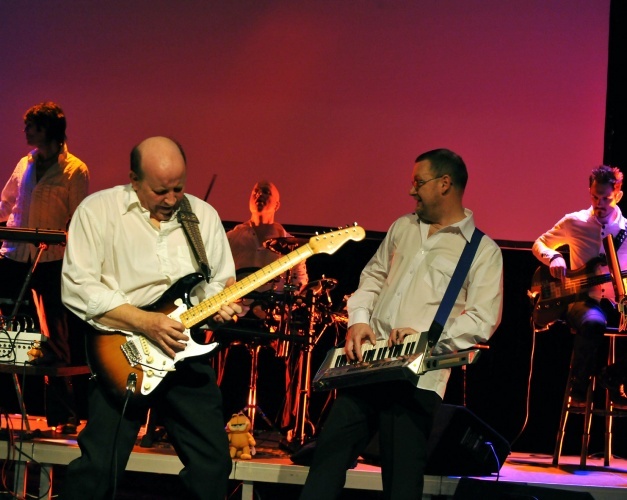 On stage, John Dyson, once one half of the duo Wavestar, was accompanied by percussionist Mark Dale, Damian Rider (bass & keyboards), Shaun D�Lear (keyboards, effects and occasional guitar) and Stephan Whitlan, a keyboard wizard from Ireland. The latter opened with two tracks. The first was Illegal Data from the K2 project album, the second was a totally new track not available on any CD. Whitlan played his own interpretation from combined famous tunes from television, such as Dr Who, including Popcorn and little snippets of Star Trek, Thunderbirds and Star Wars. His fast soloing was a real treat and evidently this musician has had some profound classical training. Then the main event, at first a genuine Dyson vacuum cleaner was exposed, acting as replacement for John, but that was obviously a neat joke. As if the man just will not age, he came on stage, wrapped in a cloth and after this was removed, his bold head was cleared from dust by a feather brush. It all seemed so familiar, bringing back memories of Dyson�s last performance in the Netherlands no less than ten years ago. 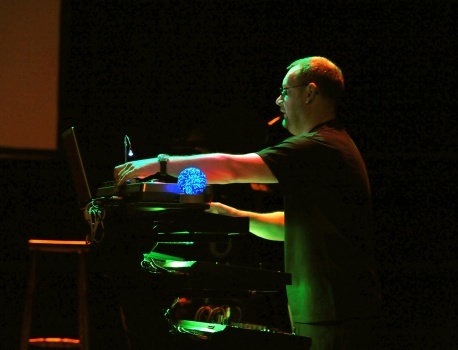 The show consisted of a mixture of Wavestar tracks and tracks from his solo-albums. The special surprises were Posevalue, a track only available on the Groove E-Day CD and several tracks of his brand new album Darklight. 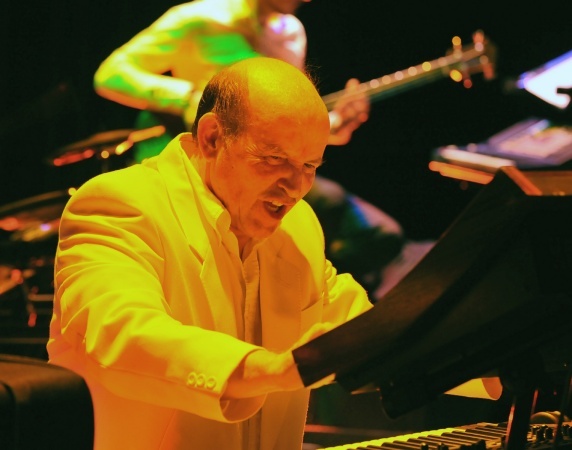 The man played his synths with great skill and finesse and obviously he enjoyed to play. Whitlan too seemed to have a good time on stage. John�s announcements were always with a humorous touch and a short story and both his synth-melodies as well as his guitar solos are characterized by subtlety and feeling. It was close to midnight when Dyson & Friends were given a standing ovation so they had no choice then to play on! The first encore was a Wavestar-track, the second was a piece once again from his newly released album. Let us all hope John Dyson will play in some venue in Holland at least once more before he decides to retire, because this was an awesome performance. Altogether E-Day has been a highly successful festival, a good venue, excellent choice of artists and well organized. Anyone with a feel for melodic EM should be attending next E-Live festival in October! Skye Boat Song ( part of Kintyre to Skye from JD album Darklight).